Two new series of digital image collages by Ashland artist Bruce Bayard are on display November at Studio A.B. Both series are photographic based with layers of texture to evoke something beyond the surface image. The Disintegration Series is comprised of images that start with a poor-quality photograph, which is then combined with layers of texture to further damage its appearance. 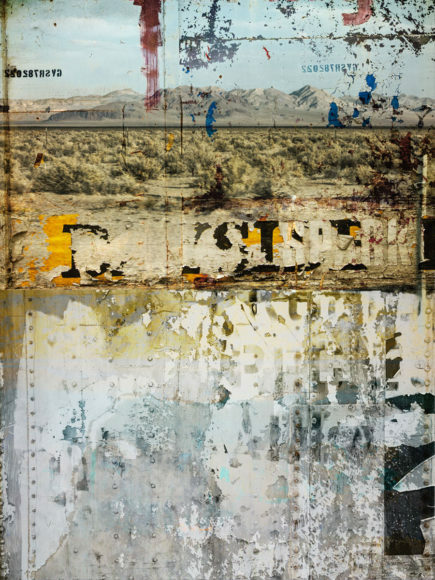 Snapshots taken from a moving car, landscapes under high-noon sunlight, and thoroughly undramatic seascapes are eroded and defaced to evoke deteriorating memories of metaphoric places. Broken Trains are extremely wide panoramas of the box cars and freight cars that roll slowly through the Ashland Railroad District. The panoramas are not continuous but rather successive multiple quick-shutter stills combined to create a disjunct view, making quick jumps between shots. Five sequential images are then combined with multiple layers of abstract textures to reconnect the images with a new kind of visual rhythm.